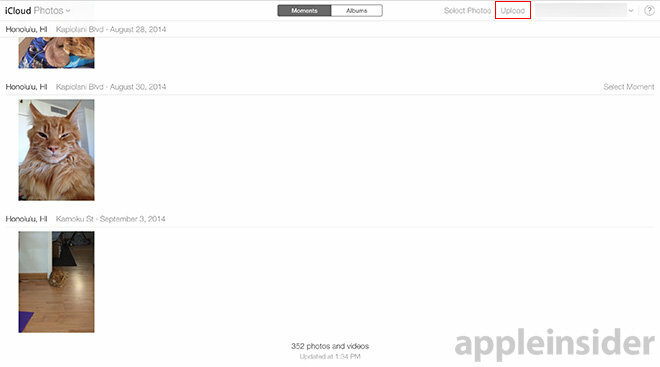 As seen in the screenshot above, a new "Upload" option appears next to "Select Photos," allowing beta users to add images to their iCloud Photo cache for browsing on iOS and Mac devices. In practice, clicking on the Upload button brings up a Finder window, from which users can select single images or batches to send to iCloud. Once uploaded, the photos are pushed down to iPhones, iPads and Macs signed in to an associated iCloud account, or made available to users granted access via iCloud Photo Sharing. The new upload feature comes a little over two weeks after the first beta version of iCloud Photos was released for public testing. In order to upload photos, however, users must be registered with the iCloud.com beta program (beta.icloud.com), which contains a separate version of the iCloud Photos beta Web app. iCloud Photos, known as iCloud Photo Library on iOS 8, lets users automatically upload photos and video from their Camera Roll for storage and cross-device syncing and download. The feature is similar to Photo Stream in iOS 7, but with support for full-resolution content and edit syncing. Currently, video files are not enabled with the Web interface as it is on iOS, though that may change when the feature makes its way to the consumer iCloud.com website.